Microgrid Institute's multidisciplinary team brings decades of experience in every facet of energy project development. On the foundation of this expertise, we provide objective and thorough analysis to support project planning, development, and execution. Our three-phase approach to feasibility assessment ensures that project factors and options are clearly understood by sponsors and stakeholders before they make strategic investment decisions. ﻿Microgrid Institute is leading the project team to advance development of an integrated clean-energy system serving the community of Warwick, NY. In July 2016, the Microgrid Institute team completed an in-depth feasibility analysis for the project. Click below to download the study final report from the New York State Energy Research and Development Authority (NYSERDA) website. Many key factors affecting the viability of a project can be readily identified in a pre-feasibility review. Using our Five-Factor Viability Matrix, our multi-disciplinary team considers 16 separate elements to yield an overall viability grade and quantitative viability scores along five factors – Economic, Technical, Legal, Market, and Process (plus extenuating or special factors). Any successful project depends on a solid foundation of operational design, technology, engineering, and system integration. 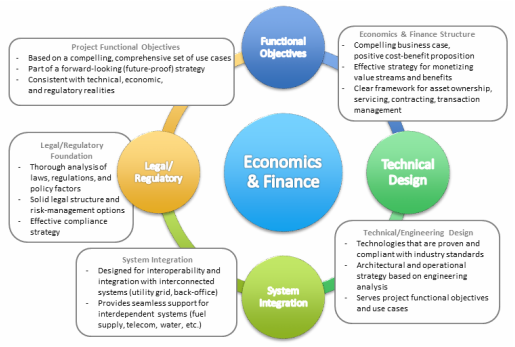 Microgrid Institute leads in-depth analysis of microgrid project technical feasibility, applying world-class engineering and design capabilities. ​We take a multi-disciplinary and iterative approach, considering interdependent issues and refining project plans to address factors affecting project feasibility to support a successful project. The difference between an economically successful development and a pure science project is usually found in regulatory, economic, and strategic factors. Microgrid Institute's team defines and analyzes key issues and produces strategic roadmaps to ensure successful project development. Functional objectives and use cases: Are they compelling? Comprehensive? Forward-looking? Are they consistent with technical, economic, and regulatory realities? Technical/engineering design: Is the technology proven and compliant with prevailing industry standards and practices? Is the design valid in terms of power engineering and operations? Does it address the project's functional objectives and use-case requirements? System integration: How will the project interact with other systems, including the utility grid and back-office platforms and processes, as well as parallel infrastructure (fuel supply, telecom, water, transportation, etc.)? How does it factor into long-range planning and development strategies? Finance/economics: How will the project be structured in terms of investment ownership, contracting, servicing, and transactions? Does the project have a compelling business case and cost-benefit framework? What financing options are considered and how do they affect project economics? Legal/regulatory issues: What regulations, laws, and policy factors might affect the project? How will it address legal and compliance requirements?